Is the initial telephone consultation confidential? 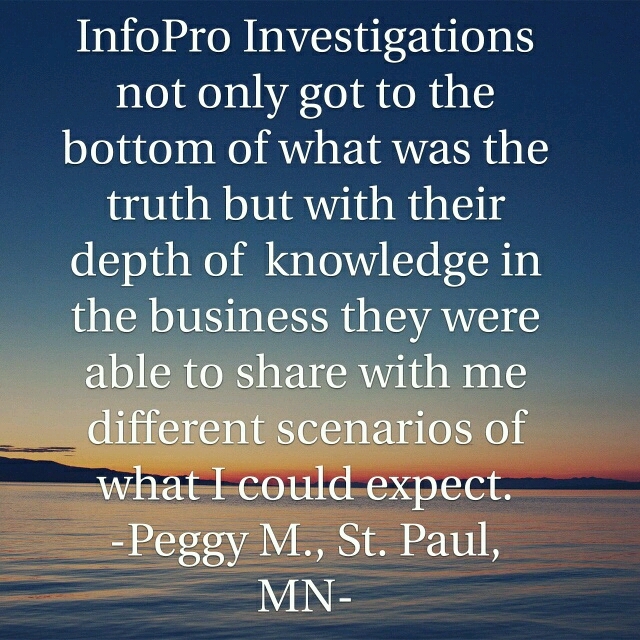 All communication with InfoPro Investigations is strictly confidential regardless of whether or not you become our client. I am concerned about speaking with an investigator about my personal issues? We have conducted hundreds of investigations that have dealt with thousands of our client’s personal issues. Our clients have trusted us and have been protected by our strict confidentiality. 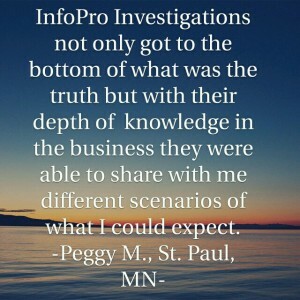 InfoPro Investigations is a recommended Minnesota and Colorado Private Detective Agency you can trust to understand your problems, keep them confidential and help you solve them. Is hiring a private investigator in Minnesota legal? Hiring a private investigator is the legal way to gather information. Investigations conducted by you, friends or family may be illegal. InfoPro Investigations only conducts investigations that are legal and will not accept a case that requires illegal acts to be committed. Yes, the evidence gathered during our investigations can be prepared and presented in court. Our investigators testify in court on a regular basis as expert witnesses. We have a testimonial page on our website. We will also provide references on request from clients who have authorized us to share their information. We have helped many people with the investigations we have conducted. Some of our clients in gratitude for this work have offered in turn to assist us in helping others. When the investigation is concluded will you provide a report? Report and videotape evidence is prepared for your case upon completion. Do you use GPS tracking devices? Do you rent GPS Trackers? Yes, InfoPro Investigations has tracked individuals with GPS tracking devices for hundreds of hours and utilized the data for investigations. We are GPS Tracking device experts and can provide GPS Trackers for investigations. During your initial consultation we will discuss the use of GPS Tracking devices and whether they can assist with your investigation. We conduct investigations with flat rate pricing and hourly rates depending on the type of case. We require a “retainer” that is based on the amount of time we estimate your case will take.